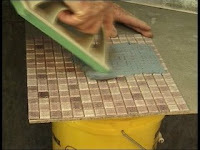 Here in Florida we install all sorts of tile sizes, textures, colors and makes. Porcelain, Ceramic & travertine being the most widely used. One of the trickiest tile to set would be Glass Tile. Glass tile are tricky due to numerous setting reasons as you will see when researching a tile contractor. I would recommend you select a Tile Contractor that is familiar with setting Glass Tile. Glass Tile are being used in the Bathroom on the walls and floors as accent bands and deco’s, on back splashes and in pools. Glass floor tiles are usually set on a crack membrane with a white, fast setting & flexible thinset. You need to set them so there are no pockets of air trapped under the tiles. An uneven install with pockets will eventually crack the tiles when they are walked on. C.O.F.. Like any gloss tile glass tiles are usually slippery when wet. If small a format tiles (1 × 1″) are used on floors the frequent grout lines create texture that will slightly inhibit slippage and add more C.O.F..
Glass tile manufacturers Villiglas, Interstyle, Oceanside and Vetrotile all manufacture glass floor tiles that are made with a textured surface that provides a high Coefficient Of Friction. The use of Glass Tile is becoming more popular and discussed more on tile help forums these days like the John Bridge Tile Forum. one of the best ways and my favorite way to set glass tile here in Florida is by using the Laticrete one-step method for setting Glass Tile. 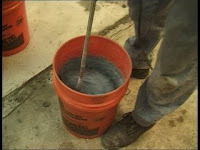 this will consists of using the Laticrete Sanded Grout (1500 Series) mixed with Laticrete 4237 Latex Thin-Set Mortar Additive. glass tile 12″ up to 24″ in size. with new manufacturing techniques glass tile continues to advance with variations in textures, styles & colors and continue to in the years to come. So no matter what size, style or color of Glass Tile you choose I’m sure you will love coming home to the new area you have transformed. If you need a great source for glass tile, subway tile, glass mosaic tile, porcelain mosaic, stainless steel mosaic tiles & polished pebble mosaic, as well as custom mosaic tile patterns, mosaic murals and mosaic tile borders check out Mosaic Tile Supplies. sorry to tell you that you cant seal a glass tile. 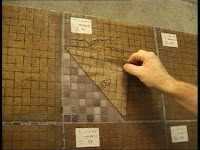 glass tile are impervious to water absorption unlike other tile that will absorb water. just to show you, Porcelain tile has a 0.5% water absorption rate and Glass has a 0.3%. since you seem to have a company that sells sealers, you might want to copy this below for your reference. Impervious: Tile that will absorb less than 0.5% of water by weight. Vitreous: Tile that will absorb more than 0.5% of water by weight, but less than 3.0%. Semi-Vitreous: Tile that will absorb more than 3.0% of water by weight, but less than 7.0%. I like the look of this niche. It is so perfectly wrapped with the tiles. Did you calculate how many full tiles it'd take to do the width and the height of the niche before the niche was build? 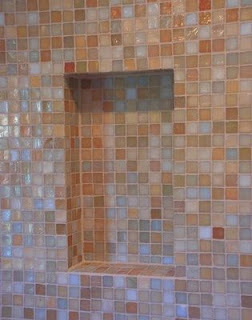 this actual niche was built out on the inside as we set the tile so everything hit full tile. Previous post: Accessible Handicap Shower…..
Next post: Achieving a Flat Tiling Surface….